As the semester kicks into full gear, the workload that comes with being a student becomes overbearing and we begin to crave that extra motivation and inspiration to keep going. Student group UMNEXT hopes to motivate students with their upcoming conference series, titled S.P.E.A.K. or Supportive Platform for Empowerment and Knowledge. Registered in May 2016, UMNEXT is one of the University of Manitoba’s newest student groups and is a division of Next Generation Worship Centre. The group was created to engage students with activities facilitated by the worship centre and to provide a safe space to build healthy and godly relationships with fellow students. “UMNEXT is a platform for students to learn and get motivated and inspired so they may achieve their full potential,” Faith Kakore, the group’s president, told the Manitoban. For their first campus-based event, UMNEXT is putting on a TED-style talk conference for students on Oct. 25. The event has been tagged S.P.E.A.K. 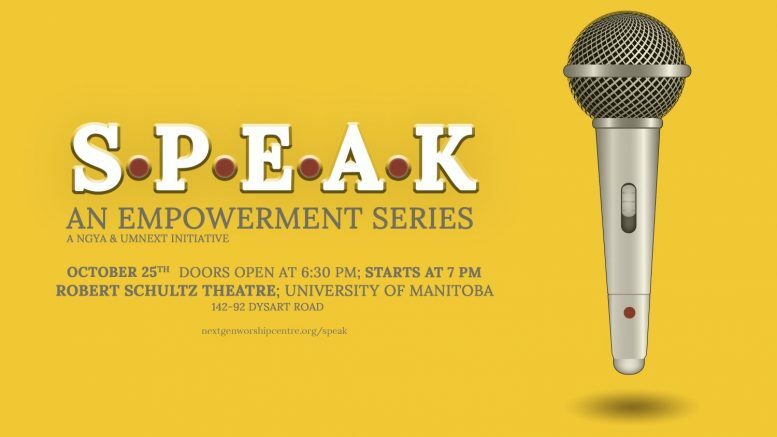 : Empowerment and will feature three University of Manitoba alumni sharing their experiences and speaking on how to experience growth personally, financially, and academically. One of the speakers, Toluwalope Dare, is the executive assistant to the vice-dean of a unit in the Rady Faculty of Health Sciences. Having completed her bachelor of science degree in biochemistry in 2012, Dare started her own company, Elyon Tax Mobile, in 2015 to assist small businesses and individuals with their tax returns and bookkeeping. The creative director of Couronne Publishing, Osamede Arhunmwunde, will also be speaking at the event. Arhunmwunde is an internationally renowned author, speaker, and entrepreneur who recently spoke at the TEDx University of Winnipeg event. His wife, Chansa Arhunmwunde, will be joining him on stage to offer up her financial expertise. S.P.E.A.K. : Empowerment will be the first installment of the S.P.E.A.K. conference series. In the future, UMNEXT will be organizing other activities for students such as game nights and worship nights. Activities organized by the group are open to all students, regardless of their beliefs. To learn more about UMNEXT, join their Facebook group “University of Manitoba NextGen Student Association” or visit nextgenworshipcentre.org. S.P.E.A.K. : Empowerment will be held on Oct. 25 at 7 p.m. at the Robert Schultz Theatre in St. John’s College (92 Dysart Road).